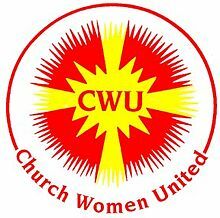 The logo of Church Women United is a circle with the exploding sun at the center. The rays suggest the dynamic force, vitality, and life of the sun as our source of light from Jesus, the Son, and our Source of Enlightenment. The rays also indicate movement, action, and power; a coming and going as God's people return to the Source for strength and then go out into the world in mission. The texture and richness of the rays symbolize the qualities the Christian women can contribute to the world. Texture relates to the way constituent parts are woven together. So it is that in Church Women United, Christian women from diverse backgrounds unite in a way that provides body and fullness for witness in a pluralistic, changing society.